If the item you have ordered has In Stock next to it, the item is currently in stock and if ordered before 2.00pm will be despatched on a next day delivery. If the item you have ordered has 2-3day next to it, the item is currently not in stock, but is due in and can be delivered within 2-3 days. If the item you have ordered has 7-9day next to it, the item is not in stock, and will need to be sourced and can be delivered within 7- 9 days. Scotland - Lowlands, Central Orders despatched to this area can take upto 2 days to be delivered. Scotland - Highlands Orders despatched to this area can take upto 3 days to be delivered. After you have placed your order you will receive an email with your scheduled delivery date. Please Note: This date is the date our carriers are expected to deliver the order, however unforseen circumstances can delay the delivery, and we would not advise any work to be arranged until the order has been received. 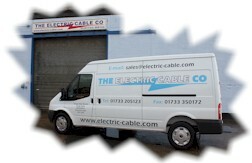 The Electric Cable Co. (GB) Ltd does not accept liability for any orders which are not delivered on the specific date stated above. Delivery is free to mainland UK on all orders over £75.00(excl. V.A.T). Orders less than £75.00(excl. V.A.T) are subject to a delivery charge of £9.50(+V.A.T). (This excludes all UK Islands including Northern Ireland where delivery cost should be requested before purchase). You can return any item to us within 14 days of receipt for any reason and get a full refund or exchange. The products must be in brand new condition with all packaging. In addition if the error is ours or the goods are faulty we will also re-imburse any reasonable return carriage costs you incur. If you would like to return anything or have any problems please either call us on 01733 205123 or email us at sales@electric-cable.com where we will help to solve any problem and advise you how to proceed. Unfortunately we cannot accept any goods where we have not been noted of a problem within 14 days of you receiving the goods. We care about our customers and are always trying to improve our service. If you have any advice as to how we can improve our service or have a problem with any service you have received, please tell us about it. We cannot rectify problems if we do not know about them.